Rain is all around us, but only a few drops fell here. From 36 miles away my daughter texted about the river in her back yard. Boo hiss I said lol. Oldest granddaughter visited yesterday, been a long time since she has done that. Very busy, worried about her chickens during the predicted triple digit temps. Took zuchinni and eggplant off my hands as their garden is behind ours. Nothing much going on, stomach still off from that yucky trip so haven't been cooking or eating. Obviously didn't rest enough after I got home, jumped back in to weeding and now am paying the price, feeling physically wrung out and mentally wild. Slogging through a couple of books. Finished watching "Extant" which became too far out at the end, but at least ended happily. Looking for something new to watch. One would think that with the vast array of video I have available I could find something, but no luck so far. Considering rewatching "Fringe" as I'm sure I missed some episodes. Picking a few cucumbers now and need to get out there and check the green beans plus grab that zucchini that I passed on last evening. Turned the heel on the sock, will work on that later. Sounds like Stockton. We are always the last to get rain. My best grade school friend moved to Stockton in the 60's. She didn't stay, but your comment made me think of her. it's not a perfect place, but we like it. 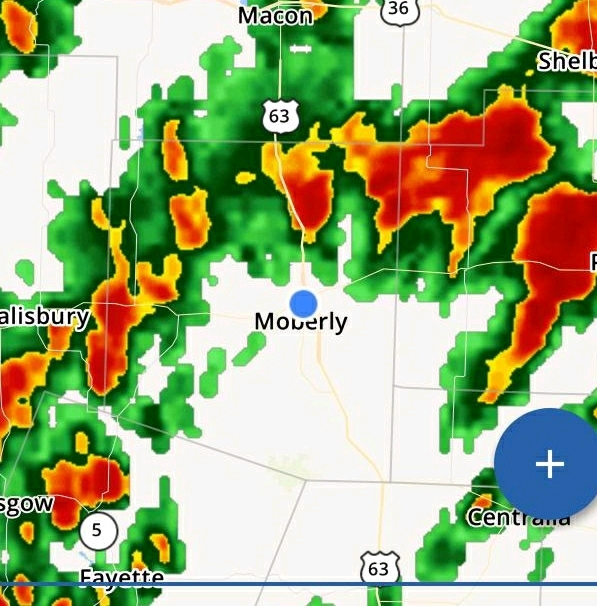 OMG, opened your journal, saw the weather map, the red, the word "Moberly" and thought, Oh no! Interestingly enough, we've not had any tornadoes yet though it is unusual not to. It's thundering again this morning but no moisture. We are still on the map and still dry. What on earth does the rain have against you? So rude! It rained here today. The weekend is supposed to be in the 90s! I hope your health starts turning around soon! Glad you got rain. Little improvements every day are encouraging me. That rain is teasing you! Just like it does out at dad's. Sometimes he can smell rain, but gets none. You are getting zucchini, eggplants, beans and cucumbers? Wow! That is so nice that one of your granddaughters was able to visit you. I've been tired for too long. Finally I can feel it is lifting today! And yay for that sock! Good luck in your book and video search. Nothing much turning up in the video department for me at the moment, but at least I've got the books covered. The husband keeps the garden watered so its producing, not abundantly but enough for us. Yes the rsin is s real tease, thundering right now but no moisture. I'm glad to hear you are not so tired...Hooray! Ah, a useful husband. Yay! At last! May you pick up next! Lol, sometimes he is useful, not always, but he still does the heavy work. Indeed, let's both feel good at the same time. Good outside, inside not so much. Sounds like Old Flame. Very practical outside, inside creates a mess!